In the south seas as well as in Brittany, Gauguin painted religious pictures, yet he was far from being a religious man in the ordinary sense. He was rather, something of a mystic, and something of a Rousseauian believer in the original goodness of man when uncorrupted by society, part of a long line of writers and artists who placed more store in the universal human values common to all religions than in the dogmatic traditions of any one. In this spirit he went back to the primitive generally, and in the same spirit, soon after he arrived in Tahiti, painted this Adoration of the Shepherds, as he supposed it must appear to the Tahitians, just as he had previously portrayed the religious visions of the Breton peasants. 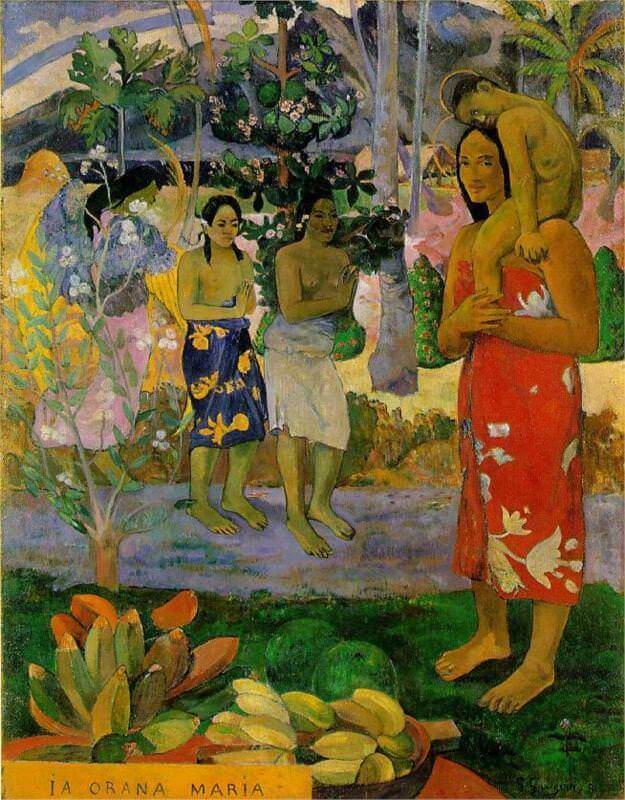 Gauguin described the picture in a letter of March, 1892: "An angel with yellow wings points out to two Tahitian women Mary and Jesus, also Tahitians. Nudes dressed in pareos, a kind of flowered cotton cloth which is worn as one likes around the waist. The background [is] of very somber mountains and trees in flower. A dark purple road and green foreground; to the left some bananas. I am rather pleased with it." This is the subject baldly enumerated by listing its parts. But it hardly describes the picture or explains its appeal. For it does not include its essential elements as a painting: the bright coloring of the main actors, that sets them off, yet leaves them part of their surroundings; the balance of the repeated verticals of trees and figures against the receding horizontal bands of the ground; the sense of peace and ease which makes this at the same time one of the latest mysterious and most monumental of Gauguin's canvases. Like some of Raphael's paintings, it is a picture so harmonious as to appear obvious. It takes some time before we see how closely knit the structure is, and perceive the wealth of detail included at no detriment to the main scene, as if the luxuriance were itself a tribute. And there is even more in combination here than Tahitian setting, native faith, and Western iconography. The motif of the adoring women side by side, their flattened figures both foreshortened and frontal, comes from the East. Gauguin took it directly from a sculptured frieze of the Javanese Temple of Borobudur, photographs of which he had bought in Paris in 1889, at the time of the World's Fair. Thus all parts of the globe are united in a single theme, common to them all.